Do you have a favourite piece of jewellery which has become broken? If you have jewellery which is showing signs of wear and tear, The Jewel Studio's excellent jewellery repairs service can fix any damage to return your ring, necklace, bracelet or earrings to top condition. We are highly recommened when it comes to repairing broken jewellery and family heirlooms and antiques will be in safe hands with our master craftsmen, who will use traditional techniques and their years of experience to repair your valuable jewellery in a sympathetic way. Lost stones can be a problem, particularly if you have a delicate piece of jewellery which you wear every day. We can supply diamonds and precious stones which are available to view at our workshop. We can use a range of stone-setting methods to return your jewellery to its original splendour. Once this is complete, you can feel confident that stones and gems will remain secure for many years to come. If a stone or gem is missing completely, we can also supply and set a new stone to make your piece of jewellery look as good as new. Jewellery is one of the most thoughtful presents that you can give, but selecting the right size can be difficult. If you have recently received a piece of jewellery as a gift but it simply does not fit, why not let The Jewel Studio help? 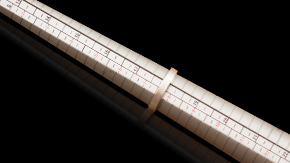 We can resize any piece of jewellery to your specification; transforming it from ill-fitting to just right in a few simple steps. 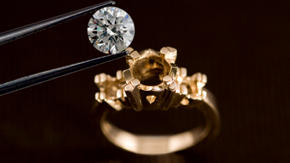 After we have resized your jewellery, we will clean it free of charge to leave it looking its very best. We can complete a range of alterations to a variety of pieces of jewellery, whether you have a necklace which is too long or too short, or a bracelet which doesn't quite fit. With our help, any piece of jewellery can fit comfortably. From a simple adjustment to a more complicated resizing, our expert team can help you to enjoy jewellery that is as comfortable to wear as it is beautiful. Whether you want our expert jewellers to remodel an existing piece of jewellery, want a bespoke, handmade piece created which is designed with your ideas in mind, or want to take advantage of our CAD design services, you can always enjoy the same high standard of service from The Jewel Studio. 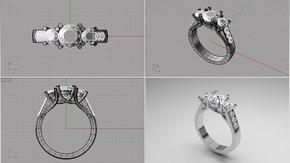 CAD enables you to get involved with the design process to ensure that we always produce jewellery which is perfect, whilst remodelling could breathe new life into your favourite piece of jewellery. Fill in your details to discuss your piece with our experts. © 2019 - The Jewel Studio.